THE fear of getting penalty points by Irish drivers last year resulted in the busiest year on record for the National Car Test with almost 1.5 million inspections carried out. New figures show that 1,492,176 tests were carried out at NCT centres nationwide last year - a rise of almost 148,000 on the previous year. The statistics, released yesterday by NCT operator Applus along with a new-look website, also show that more cars failed than passed the test for a fourth year running. A further 5,432 vehicles (0.4 per cent) were immediately put off the road by NCT mechanics who deemed them too dangerous to drive away from the test centre. This was 632 more 'fail-dangerous' stickers applied than 2014. Since the end of 2014, driving without a valid NCT disc is a fixed charge motoring offence attracting three penalty points. 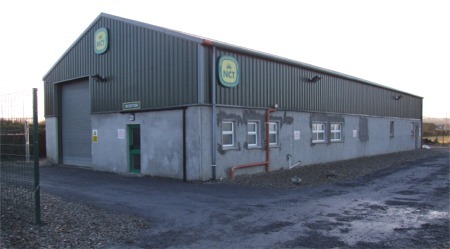 The NCT centre in Carndonagh. Applus confirmed that more drivers presented cars for the NCT last year "mainly due to improved compliance as a result of changes in law relating to NCT non-compliance". Spokesperson Sinead McKeon added that the continuing trend of more cars failing than passing the test was consistent year-on-year. And she said the number of cars deemed dangerous was relatively low when seen against the large number of vehicles tested overall. "When you look at this figure in relation to the total number of vehicles that are inspected annually the figure is relatively small," said Ms McKeon. Many Irish drivers continue to use the NCT test as a diagnostic tool and put cars through the test first to see what needs fixing in order to get a pass on the re-test. Of the 767,675 cars presented for a re-test last year, 698,376 (90.9 per cent) passed and 68,309 (9 per cent) failed a second time. Some 990 vehicles (0.1 per cent) were again ruled unfit to drive after the re-test. Cars undergoing the NCT last year were 2011, 2009, 2007, 2005 and some older models. The top failure items were front suspension; brake line and hoses; headlamp aim; tyre condition and faulty stop lamps. The roadworthiness test was introduced here over 15 years ago in line with EU regulations. It currently costs 55 euro for the test and 28 euro for the re-test. Applus' financial results for last year are not yet finalised however the Spanish firm made an operating profit of €3.89m on revenues of almost €75m here in 2014.